What is a Bezel? And What Does Bezel-less Mean? The easiest way to think of the bezel is as the frame around the photograph. On electronic devices, such as smartphones, tablets, and televisions, the bezel encompasses everything on the front of our devices that isn't the screen. The bezel adds structural integrity to the device. But it is at odds with the technological trend to create the biggest and best screen possible on those devices. For phones, we've pushed up against the maximum possible size with phablets like the iPhone "Plus" series, the XS Max, and the Samsung Galaxy Note models. After all, a phone must fit into our pockets and rest comfortably (and, in the case of phablets, slightly uncomfortably) in our hand. So in order to increase screen size, manufacturers must decrease the size of the bezel. 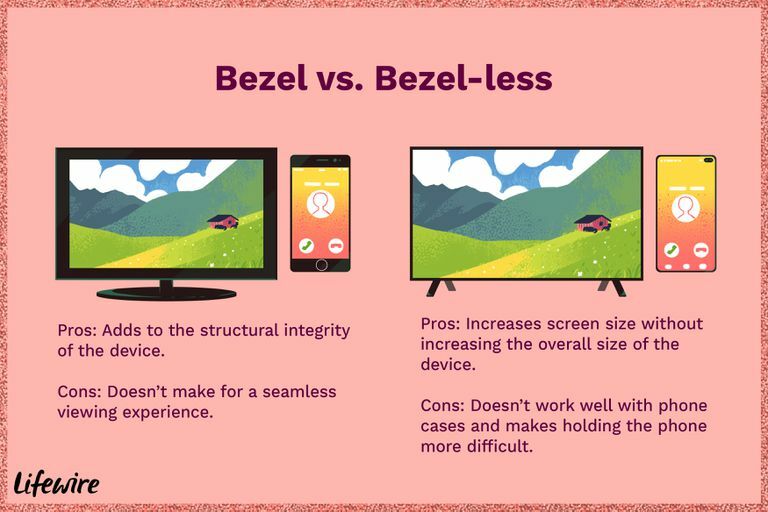 What Are the Benefits of Bezel-less Devices? When we refer to 'bezel-less', we usually refer to less bezel rather than a total lack of bezel. We still need a frame around the screen. This isn't just for structural integrity, which is important. We also need to house electronics such as the front-facing camera on our smartphones and tablets. The obvious benefit of reducing the bezel is an increase in screen size. In terms of width, this usually marginal, but when you replace the buttons on the front of the phone with more screen, you can add a fair amount of size to the screen. For example, the iPhone X is only slightly bigger than the iPhone 8, but it has a screen size that is actually larger than the iPhone 8 Plus. This allows manufacturers like Apple and Samsung to pack in bigger screens and reduce the overall size of the phone, making it more comfortable to hold in your hand. However, more screen space doesn't always mean easier to use. Usually, when you jump up in screen size, the screen is getting both wider and higher, which translates to more space for your fingers to tap the onscreen buttons. The emergence of bezel-less smartphones tends to add more height but only a little width, which doesn't add quite the same ease-of-use. What Are the Drawbacks to Bezel-less Design? You didn't think it was all good, did you? When it comes to tablets and televisions, a bezel-less design can be great. These devices had huge bezels compared to what we see on our smartphones, so making the most of the space can really add to the screen size while keeping the dimensions smaller. This plays out a little different when it comes to our smartphones, especially those that have gone to almost no bezel on the sides such as the Samsung Galaxy S8+. One of the most important accessories for our smartphones is a case, and once you wrap a case around a phone like the Galaxy S8+, you lose part of the appeal of that wrap-around edge. The bezel-less design also leaves less room for your fingers. This isn't just less room on the screen, you also have less room on the sides to actually hold the device. This can lead to accidentally tapping a button or scrolling down a webpage just because you changed your grip. These issues are usually overcome once you get used to the new design but can detract from the initial experience. What About Bezel-less TVs and Monitors? In many ways, bezel-less televisions and monitors make a lot more sense than bezel-less smartphones. HDTVs and computer monitors don't have the same requirements as a smartphone's display. For example, there is no need for a front-facing camera on your television. (In fact, many people find that creepy!) You can also skip the speakers, and because we only use the buttons on the TV itself when we've lost the remote, manufacturer's can hide those buttons on the side or on the bottom of the TV. You can argue that the bezel can actually help a smartphone's picture by framing it, but we've had completely bezel-less televisions for a while now. We call them projectors. Of course, part of the reason why no bezel works so well on a television is because the wall behind the television acts as a visual frame. But, outside of projectors we aren't quite there yet. Manufacturers may advertise "bezel-less" displays, but again, these are really less-bezel displays that have a very thin frame around the screen.